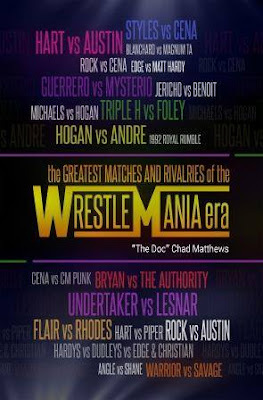 Chad "The Doc" Matthews of LordsofPain.net fame is back with another countdown of the top 100 something-or-others of the WrestleMania Era (for Doc's purposes that's 1983 to the present). While his previous tomes focused on the greatest stars and champions of said era, his latest volume deals with the top 100 matches and rivalries of the past 35 years in both WWE and WCW. Matthews' intent here is to create an objective match/feud ranking, taking into account not only the quality of key matches, but the buildup to them, the character interactions, and the feud's overall impact on the business for its time (The end of the book covers his scoring methodology in detail if you're interested). After poring through decades of matches and moments, Chad put each candidate head-to-head with its peers in an attempt to nail down a definitive Top 100 that any wrestling fan can reasonably agree with. As with all art forms, there is of course an unavoidable element of subjectivity when trying to argue that Match/Rivalry A is better than B, but Matthews does present a lucid, pretty compelling argument for the placement of each entry. There are definitely inclusions (and exclusions) I didn't agree with, but I have to give the author credit for making a strong case for his rankings. For example Hulk Hogan vs. Shawn Michaels being in the top 40, above many other feuds/matches I would deem far superior. I wasn't a fan of this feud or match in general at the time and I've never felt the urge to revisit it. But between Hogan-HBK drawing a very strong buyrate, Shawn managing to carry the entire feud on his own (Hogan opted not to appear on basically any TV leading up to the match), and Shawn getting out of Hogan one of his best-ever bouts (though hardly one of Shawn's best), I can at least appreciate why Matthews rates it so highly. If you've read Doc's LOP columns you already know he's a fair and well-reasoned debater, and that comes across in the book as well. For the most part though I agreed with the 100 matches and rivalries on the list, even if I didn't necessarily agree with some of the placements. The top 10 however is tough to argue with. I won't spoil them here, but none of them should surprise you. Each is a classic feud that either changed the business, provided great television moments and/or led to spectacular in-ring battles. This book is a breeze to page through and carries with it a pleasantly nostalgic tone; you'll find yourself saying "Yeah, that match was amazing," or "That feud was the balls!" As a 30+ year wrestling fan myself I'm able to grasp the historical perspective for just about everything covered in the book (I wasn't around for Ric Flair vs. Harley Race for instance, but I experienced all the inclusions from late '86 on as they happened). Nearly every significant WWF/E and NWA/WCW bout and rivalry is represented here, either in the top 100 ranking or in the Honorable Mention chapter; Doc leaves almost nothing out. 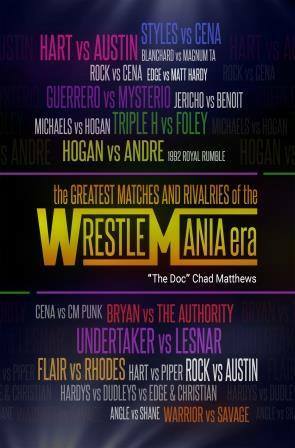 Whether you're a longtime wrestling fan reminiscing some of your favorite old-school feuds and matches or a newbie hoping to gain some insight into the great bouts of the 80s and 90s, The Greatest Matches and Rivalries of the WrestleMania Era is a fun little trip down memory lane. This book is available as of 8/1 at Amazon, in both Kindle and hard copy form!